Finally the tiles are packed in recycled cardboard packing and then wooden crates (for added protection). The most popular tiles are 300 x 300 x 10 mm and 305 x 305 x 10 mm (12" x 12" x 3/8") They are packed 10 to a box and a typical container load would have the equivalent of 750 square metres, meaning between 805 to 835 boxes. 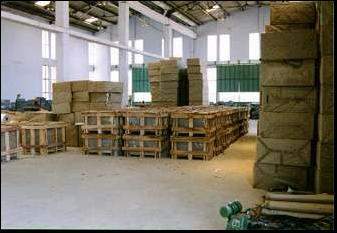 This image shows calibrated granite tiles packed ready for shipment by container. Our customers specify whether they require a 20' "Closed Unit" or "Open Top" depending upon their handling methods. All container corrugated walls are 8'6" high. 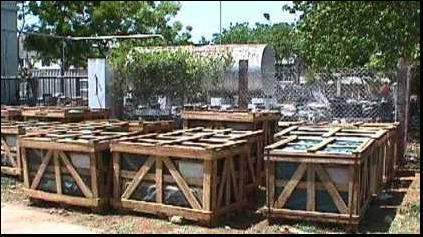 Most choose "Closed Units" since "Open Tops" are always in short supply but this does mean the container is completely fumigated and sealed before shipping to prevent pilferage and it also keeps the crates dry. There are some "Open Top" units that do have completely removable metal tops however the majority are the usual removable bows and a removable tarpaulin. 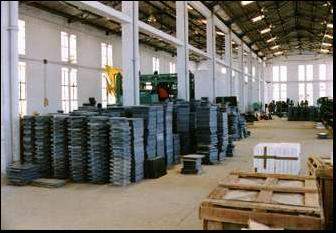 Crates of tiles packed ready for shipment. 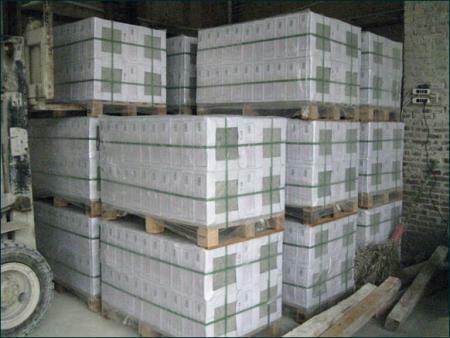 Before loading all the crates will have shipping marks painted on them for easy identification and Customs purposes.